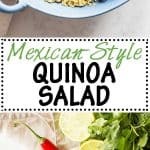 The most delicious Mexican Quinoa Salad of all times. Healthy avocado, protein-rich black beans, a boat load of cilantro and a little heat make this Mexican quinoa recipe more than complete. So let’s start this with “yes, I know quinoa isn’t Mexican”. I’m half Peruvian, believe me, I know where Quinoa comes from. 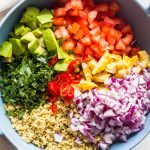 I’m still going to call this Mexican Quinoa Salad because it’s prepared Mexican-style ;) For non-Mexican-style quinoa recipes check out this Instant Pot Quinoa Bowl or this Turmeric Quinoa Salad. If there is one ingredient that I use A LOT in my kitchen, it’s hands down Quinoa. 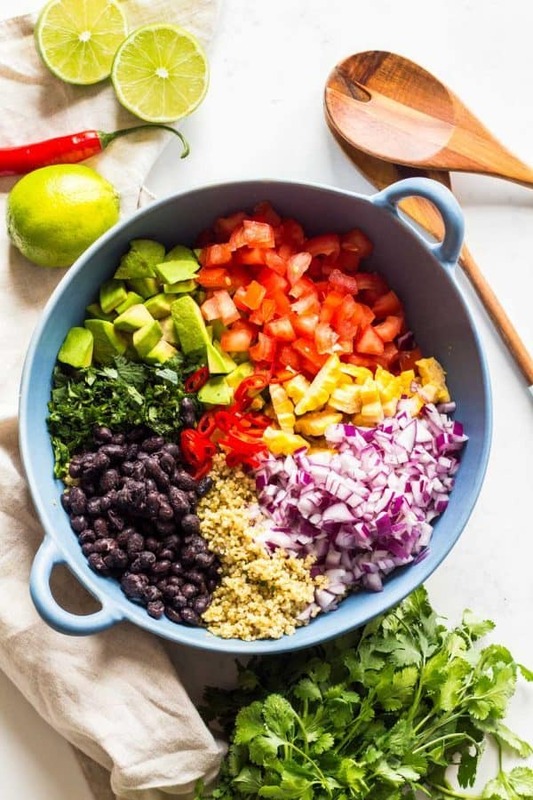 Full of cilantro, black beans, fresh tomatoes, red onion, avocado, a little chilli and pleeeenty of lime juice all mixed into a bowl of freshly cooked quinoa. It’s amazing! I’m serious! To cook the quinoa you can either add 1 cup of quinoa and 1.5 cups broth into a small pot, bring to a boil and once boiling immediately cover and reduce the heat to low. Let simmer for 12-15 minutens and you’re done! Alternatively you can use an Instant Pot or any other electric pressure cooker for that. I prefer this method because it’s a more hands-off approach AND I prefer the texture of the quinoa this way. Add a cup of quinoa and a cup of broth to the Instant Pot, put on the lid, make sure the valve is in the sealing position and set it to 1 minute on high pressure. Then let the pressure release naturally until the pin drops. That takes about 10 minutes. Yes, not only is quinoa not Mexican, yellow sweet corn isn’t either but but but it’s soooo good in salads. For black beans I highly recommend home cooked. If you’re in a rush or didn’t plan ahead canned works, too of course but if you can anyhow fit it into your schedule, take the time and soak 12 hours and then pressure cook for 20-ish. If you’ve been following along for a while, you already know all about my obsession for Avocado Toast. Well, this recipe isn’t complete without avocado. It’s so hard to pick good ones but once you practice you get better every time. My experience with small Mexican avocados is much better than the giant Brazilian ones. I always feel attracted to buying the big ones. They look so impressive. It’s always a bummer though when they’re black and rotten inside despite being firm. The most delicious Mexican Quinoa Salad of all times. 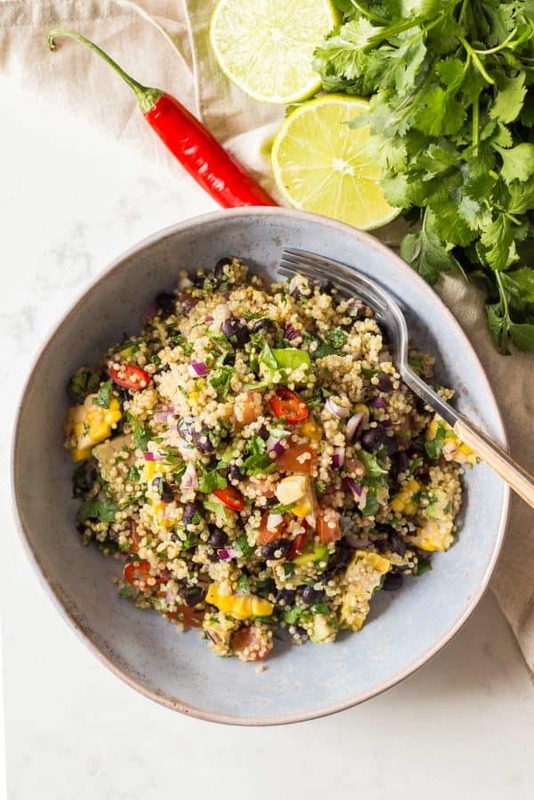 Healthy avocado, black beans, a boat load of cilantro and a little heat make this Mexican quinoa recipe more than complete. Add quinoa and stock into a pot and bring to the boil. Once boiling reduce heat immediately to low and cover tightly with lid. Cook for approx. 15 minutes or until done. OR add 1 cup quinoa and 1 cup broth to Instant Pot. Turn valve to sealing. Set to 1 minute on high pressure and then let pressure release naturally (takes about 10 minutes). Wash and deseed tomatoes and dice into corn-size pieces. Wash and peel onion and chop VERY finely. Peel avocado and dice into corn-size pieces. Wash and chop cilantro leaves. Add to bowl. Cut off kernels from ear of corn. Once quinoa is cooked, fluff with a fork. Add to bowl with all other ingredients. Season with salt, pepper and a lot of lime juice. Stir and serve. How long does this keep for? If you add the avocado each time you serve it that is? 4 days in the fridge. Almost all protein (plant and animal based) lasts for up to 4 days in the fridge. My husband doesn’t care for cilantro, what could I substitute ? This salad has 390 calories? For the components I thought should be more than 500. Thanks for the reply. Hi, “one serving” has 390 calories according to my nutrition calculation app. Since I calculated this salad as a side dish for 4 people one serving is 1/4th of the whole salad. Take all the nutritional information offered here with a grain of salt though please. I am not a nutritionist and not trained to make such calculations. I rely on my plugin and on common sense when something is way off I go and recalculate using other websites to corroborate numbers. Im making this tonight! One question, though – what is the serving size? I’m tracking my macros these days and want to get it right. Thanks for breaking them all down, but I’m not sure if your numbers are for the entire recipe or for single serving (and how much is a single serving). Thanks!! Hi Susan, 1 serving is a quarter of the whole salad. The nutritional values in the box are for 1/4 of the salad. However, I am not a registered dietitian and I use a plug-in to calculate nutritional values, which is why you should only take them as an estimate or use your own trusted calculator. This has become a staple in our home. We love it! I am so so happy to hear that Jeanne!!! Hi Aideen, typically all proteins (animal and plant) last 3-4 days in the fridge. From an FDA safety standpoint of view 3 days should be totally safe. That being said, I store meal prepped meals of all kinds for up to 5 days. On the 5th I might sniff it before eating (just in case) but I almost always eat it ;) Now, the avocado will get pretty gross after only 1 day so you may want to add that on the day of only, not in advance. Excellent. Will try it !! Would love to have some reciepes. Omg!! Just made this salad without the corn and replaced with red and yellow bell peppers .. yummy.. This will be great for lunch and I will add the avocados last before I eat it!! Thank You, Thank You!! What type of red Chili do you use? Is it red jalapeño? No, I used a Thai red chili. It doesn’t really matter. You can choose which ever one is your favorite. I chose red mostly for color contrast. I like green jalapeño and green serrano a lot though. Can you serve this cold? Since all ingredients are put in without cooling the quinoa I’m wondering about the best way to bring it to a pot luck? Yes!! It’s supposed to be cold. I always let the quinoa cool down. I don’t have an instant pot..can I use a crrock pot or something else? It seems like the fat count is wrong in this. With half an avocado it must be more fat than 3 grams. The recipe looks fantastic though. Yes, you’re right. Thanks for catching that. My program got confused with the “small” and thus didn’t calculate the avocado at all. Just corrected the mistake. Avocados are a good fat, so I am not going to worry about that. Looks delicious, can’t wait to try this recipe. Is it necessary to rinse quinoa before cooking? I never do. I don’t believe it’s necessary. Some will argue that but in the end it’s your decision. Looks amazing but as a diabetic, 43 grams of carbs per serving is high (30 should be my goal). What might I substitute to reduce the carb count? Regardless of the “type” of carbs, diabetics have to strictly limit intake of this macronutrient, and keep within the guidelines for max grams per meal as set by their doctors and nutrition counselors. Replacing the beans with an animal protein – or simply leaving that ingredient out – is a good option to get the total carb number down. I have diabetes, and went on a plant-based diet. I could never get my blood sugar below 150, now my numbers average 105 to sometimes below 100, which hasn’t happened in 14 years. I eat grains, legumes, and even bread. I take two BS lowering medications, but I was able to give up my nightly insulin, all with my doctors supervision. It doesn’t seem like it ought to work, but it does, and I have more energy! It’s life changing. I love your story!! Eating real food can man all the difference! For a diabetic, the Carb count is actually 43 -3-8 for a total of 32. It’s perfect. Plus everything thing is healthy carbs, not sugar or floor based. As a type 1 diabetic myself, is perfectly acceptable for a meal. Love Love LOVE!!!! Thanks for sharing! I’m going to be trying this as soon as possible~! This sounds delicious and simple. Which for this time of year I appreciate. I’m making it for myself and a coworker this week for lunch. Hi there. I’m thinking of making this for my summer party but some people don’t like cilantro. Can I omit it? Yes, Marilou, you can either omit or replace with basil, just as yummy. I have to lose weight. Can I still have this and still stick to my weightloss? Hi Jay, it all depends on what kind of weight-loss journey you’ve gone through. In my opinion, as long as all you eat is whole foods and nothing overly processed, and as long as you pay attention to your macros, weight will in most cases not be an issue at all ever. SO is the corn of the cob cooked first or it is served raw? Hi Mark, the corn is cooked. You can’t eat raw corn :) The recipe’s ingredient list says “cooked corn”. You CAN definitely eat raw corn. Freshly picked it is especially delicious. My family prefers it raw off the cob in summer all the time. That’s very interesting! I’ve never heard this before. I’ve also never had corn that fresh I have to admit. I will try if I ever get the chance. I cannot use lime because it interacts with a medication I take. Could I substitute lemon instead? Absolutely Joan! You can use lemon or any mild vinegar like rice vinegar. Hi, I can’t eat corn, what can you suggest as an alternate? Yellow bell pepper is an excellent idea! Why is the sodium content so high? You find 400mg high? You can reduce it by using water instead of stock to cook your quinoa and not adding any salt to flavor the salad. 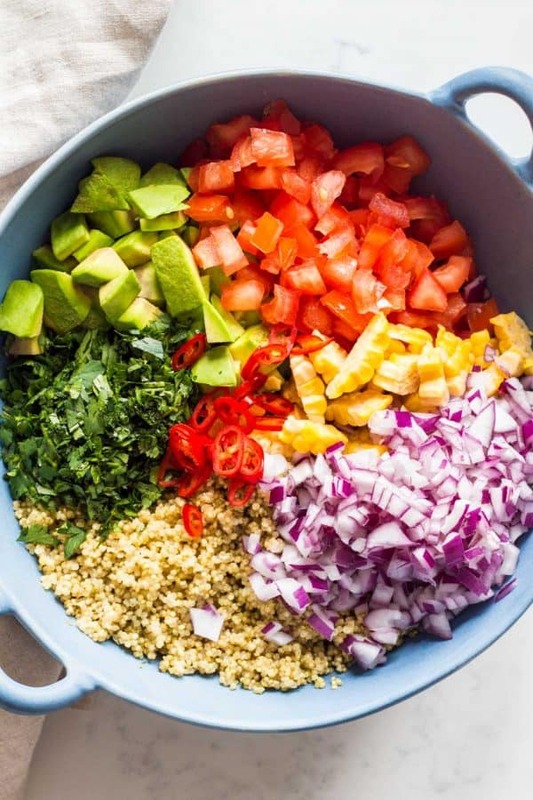 Could you clarify how much quinoa you are using in the recipe? 1 cup cooked or the full amount prepared by following the steps in the recipe (after the 1 cup dry is cooked in the vegetable broth)? I used the full amount prepared per the recipe and it turned out delicious, but I get almost double the calories in my calculation using my fitness pal. Hi Jamie, 1 cup UNCOOKED quinoa which makes about 2-3 cups COOKED quinoa. That’s what I used. All those calorie counters are somewhat inaccurate. I actually hate them but google requires us to add nutritional information. I’m not a dietician so I’m always concerned it’s somewhat wrong. Please only take the nutritional info as an estimate. The double calories could have come from the size of your avocados? Avocados have a ton of calories. Also, this recipe is 4 servings. Did you divide it by 4 for your calculations? If you divided by 2, you’ll have double the calories of course. Is this good being served after chilled overnight in the refrigerator? Yes! It tastes delicious. If you plan on storing in the fridge however I recommend adding the avocado to the plate directly, not into the big bowl, otherwise it’ll go black. It still tastes good but obviously doesn’t look as appetizing anymore. If you add 1/4 avocado to your serving and store the other 3/4 in an airtight container and then add the next day it’ll stay greener. Love the flavors in this recipe. The only change I would make is to dry toast the quinoa before cooking it – love the crunchiness and slightly nuttier flavor after dry toasting. Hi Laura, very good suggestion! I often do that with rice. Never thought about doing it with quinoa, too. Will have to try that next time. Please explain how to dry toast the quinoa. Thank-you! Ahhh… show me a quinoa salad with beans and lime and you’ll be my friend for life!! Love absolutely everything about this salad. I think I see lunch tomorrow! Thank you best friend ;) Let me know how you liked your lunch! this sounds amazing – my kind of lunch for sure!